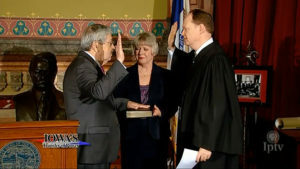 Govenor Branstad takes the oath to become Ambassador to China. 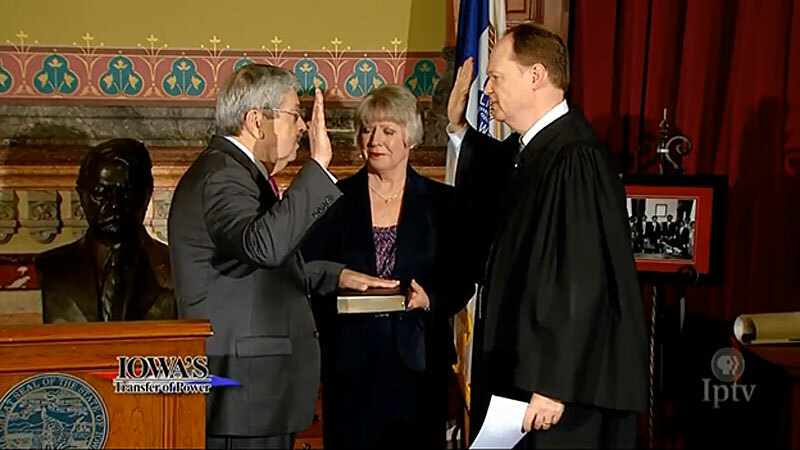 Iowa’s two U.S. senators are hosting a send-off reception in Washington D.C. later today for Ambassador Terry Branstad who will leave soon for his new assignment in China. There’s much talk about the potential progress Branstad could bring in relations and trade between our nations, and Senator Chuck Grassley says he’s a believer. Long before Xi Jinping became the leader of the planet’s most populous country, he visited Iowa in the mid-1980s, toured several farms and met then-Governor Branstad. The two have remained closely acquainted over the decades and Grassley says that’s a huge advantage for Branstad as the incoming U.S. ambassador. “That personal relationship will help get him off to a fast start,” Grassley says, “maybe faster than some other ambassadors with any particular country.” How much power does an ambassador truly wield? Grassley reminds, ambassadors are diplomats, not elected officials, and they don’t really have “power” in terms of political clout, but they certainly have in-roads and influence. Today’s send-off reception is scheduled for 4 P.M./Central time.